The 1950s Delt Reunion, planned for early September, will feature a campus tour and a stroll down memory lane with Stew Willams. Please join us! In the past, we met on Friday night at The Marcum Conference Center Hotel and gathered for a buffet dinner and cocktails. The bar is small and the dining room is too much like a dining hall. This time, we will gather ten minutes down the road from Oxford, in the quaint town of Reily at the Indian Creek Tavern, circa 1858. A great place with full service bar, beer and wine, soups, salads, sandwiches, daily specials and award winning hand-tossed pizza. This is the hottest place in Butler County with an amphitheater and plenty of room for us. Look up their web site at www.indiancreektavern.net. Mid-morning tour of the latest structures on campus with Miami's Delt Brother Bob Keller, well-known architect and campus planner. After the tour, you may want to go up town for something to eat or just visit with friends.Around 5:30pm, we will be the guests of the Delt house for a gathering. 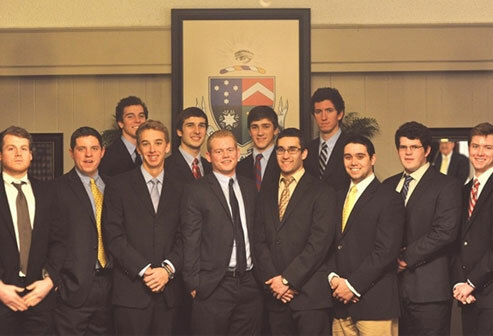 You will be able to meet some of the undergraduate Delts and meet a few of the guys who are managing the Chapter. At 7:00pm, we will begin our traditional Reunion Dinner at The Marcum Hotel and Conference Center. After dinner, Brother Stew Williams will put on his picture presentation bringing back past memories of when we were on campus. Some in the past have gotten together for a departure breakfast up-town before heading for home. Others went to the church of their choice and others had to make air flights. For those who do not want to stay at The Marcum, there are more choices of accommodations in Oxford. We will have to give up the unused rooms at The Marcum soon as there is also a football game that week-end in Oxford.